In keeping with this week’s wedding theme, I thought that I’d propose (yes, pun intended) a hoop dilemma to you. I have a bride that I am currently designing an embroidery hoop for which will take the place of the traditional ring bearer’s pillow. The wedding colors are coral and ivory (which I love!) with a hint of mint. The bride had some samples of work that she fancied, but also gave me artistic liberty to some extent. 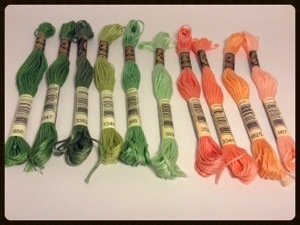 These, of course, are the colors that I’m working with. These are some doodles that I came up with and the corresponding instructions on how to interpret my doodles. The little black heart/X-like thing that appears in each design represents the ring ribbon (I do not claim to be a great artist!). Hoop #1’s design is similar to this one:https://www.etsy.com/listing/123425543/hello-embroidery-hoop-in-yellow this design would feature both the 369 and 368 green colors and will feature either only the 352 coral color or will use a lighter coral shade for the flower buds around the perimeter. 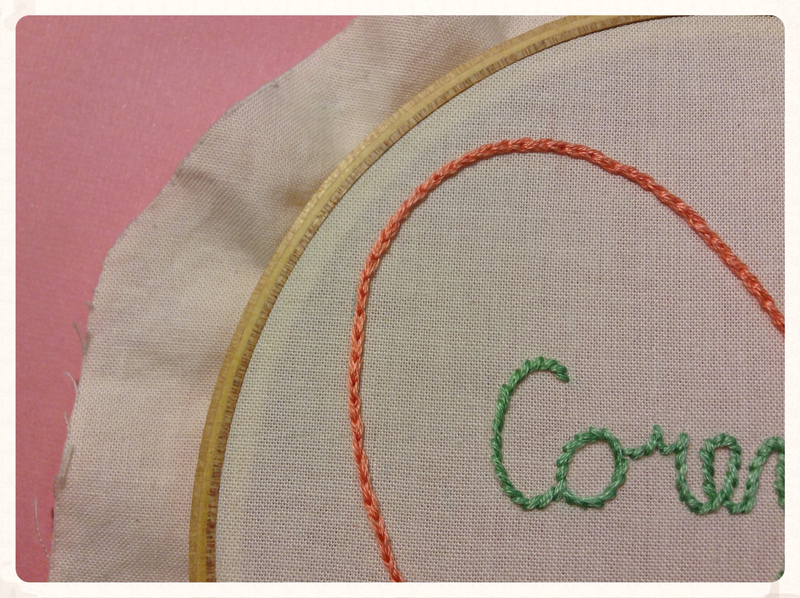 Hoop #2 is plain and simple featuring coral 352 and green 368. Hoop #3 is similar to #2 with the addition of loads of running stitches. It looks sort of cartoonish using paper and markers, but it is much more subtle using fabric and floss! The second attachment here shows what these running stitches would look like. It’s a fun extra pop of color. The running stitches would feature lighter shades of coral & green (still in the same families) so that the lettering in the center would not be overpowered. Ivory colored fabric will be used regardless of which ever design is selected. And then I gave her this teaser shot of some doodle stitching. So, if you were to assist her with selecting her final design, which way would you sway her to? Poor brides, we get stuck with all of the tough decisions! I’m torn between 1 and 3, but I think I’m leaning more towards number 1! All of them are too cute.